FAYETTEVILLE, N.C. – The Playoff Push is upon us! 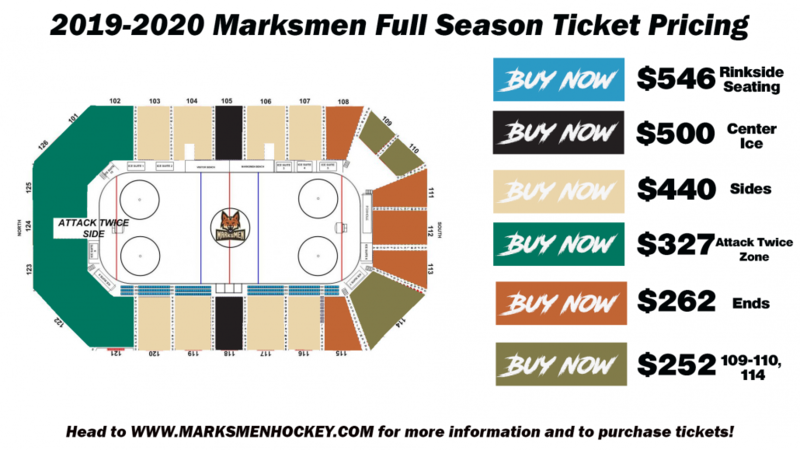 With your Marksmen in a tight-battle for post-season positioning heading towards the end of our 2018-2019 season, the time is now to be thinking about next season for our loyal fans! 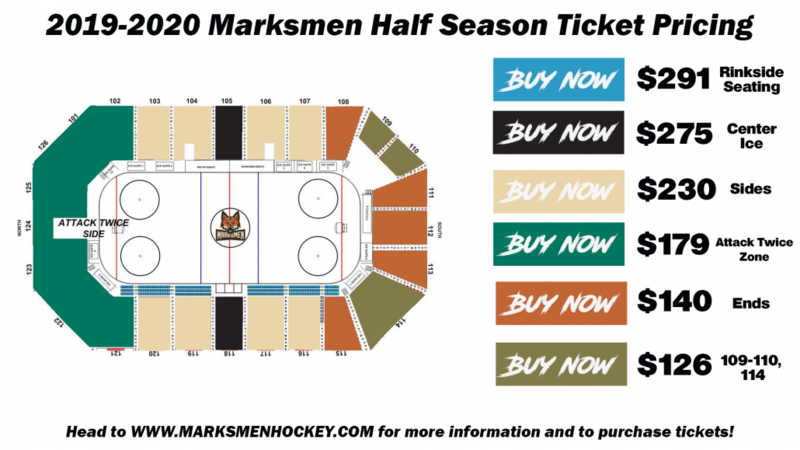 By that, we mean it’s time for us to unveil our ALL NEW Full & Half Season Ticket prices and benefits, and they’re more convenient, affordable, and fun than EVER BEFORE for our fans. Check out our new pricing and sections below. The discounted prices, with less confusing sectioning, now makes it easier to pick exactly where you want to sit, and sit right inside of your price-point! Entry into “30 Days of Hockey” giveaway. That’s MORE benefits than EVER offered before, and is our way of giving back to the fans. We want more people than ever before to have the accessibility and ability to be part of our exclusive family of full-season friends. Don’t miss out on your chance to take advantage of exclusive pricing and early benefits – and don’t let your seat be taken by someone else eyeing your position. 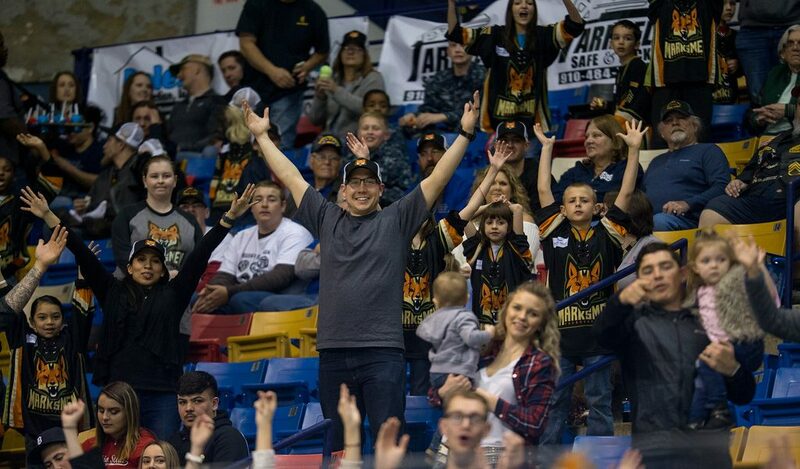 Our Half-Season Tickets are an even more affordable way to see the best action the Crown has to offer, around your 14-game schedule! With the same benefits as Full Season Ticket Holders, and the price that is more affordable or convenient for a busy family, there’s no excuse not to get your package. With the same sectioning and benefits, check out what we’ve got to offer for our busier fans, or those testing-the-waters. If you have any questions regarding the new prices, benefits, or anything, make sure to attend/watch the Kickback Jack’s Coaches Show on Tuesday, February 5 at 6:30-8 P.M. where Director of Ticket Sales Dan Chizmar will be answering questions LIVE and talking with fans. 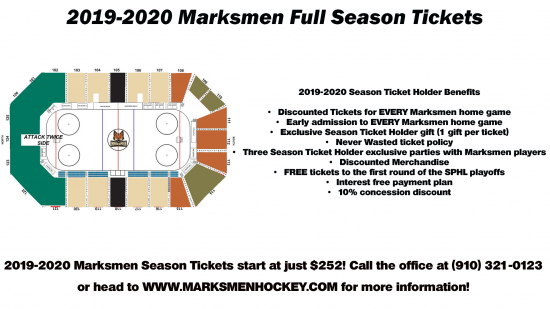 If you’re unable to watch or attend, you can always contact the Marksmen Office at (910) 321-0123, or email Dan at DChizmar@MarksmenHockey.com for help. We look forward to having you out to the Crown for 2019-2020.